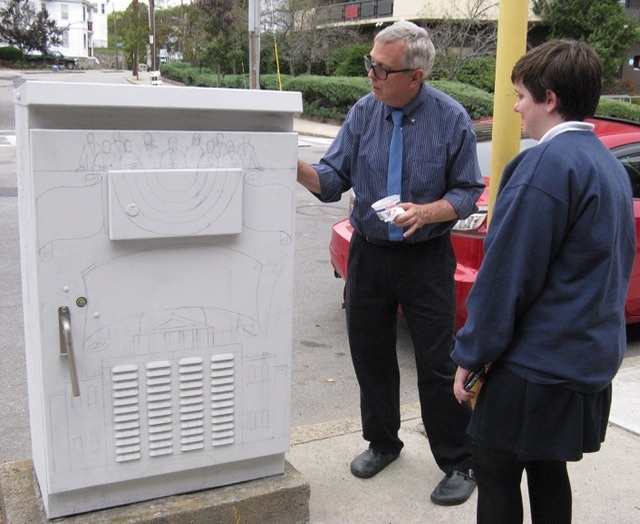 When Martin Boyle the art teacher at the Mystic Valley Regional High School heard about the Malden Arts Switchbox Project contest to design a switch box commemorating Herbert L. Jackson, he knew the students from the Art Club would enjoy doing this public art project. A switchbox is a metal cabinet that is mounted on a concrete pad containing a controller which changes traffic signals. 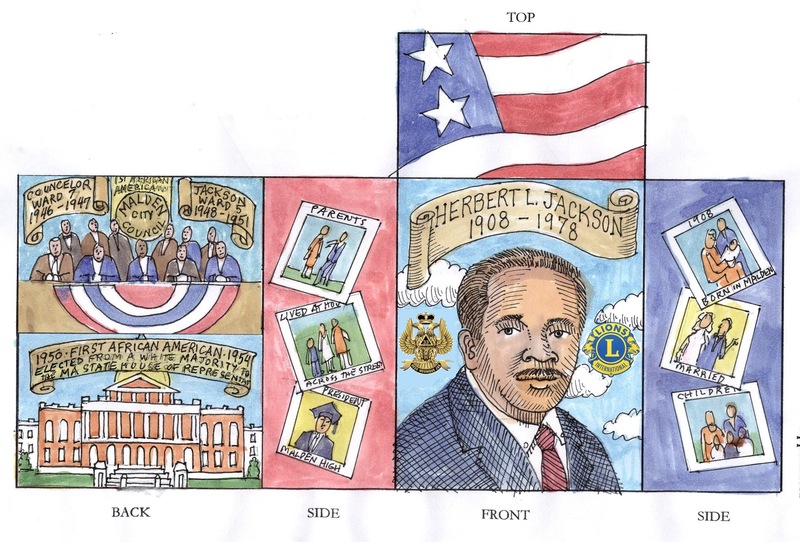 The students ultimately learned about Malden’s first African American councillor while working outside in the community on something that will be there for years to come. Councillor Barbara Murphy, Ward 5, had approached Naomi Brave, president of Malden Arts, with the idea and offered $500 to the winning proposal. Malden Arts agreed to pay the standard stipend for painting a box, $150, and Councillor Murphy the remaining $350, according to Brave. After Malden Arts reviewed the applications they went to the Malden Cultural Council for final acceptance with recommendations from Malden Arts. Martin Boyle created the switch box design using those photos and ones he found through his own research. His students modified it with their ideas. 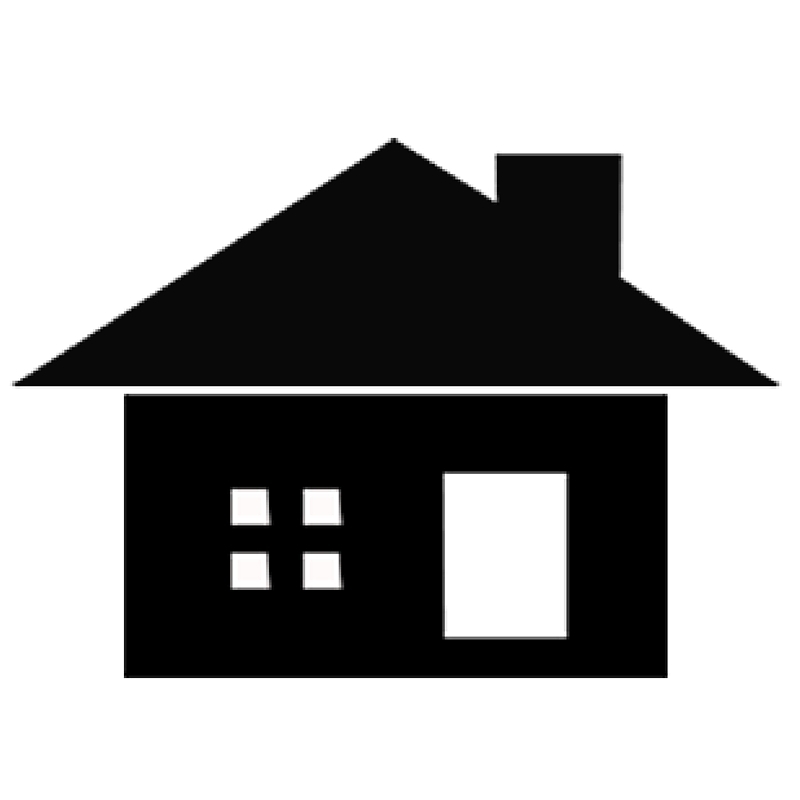 For example, one student made the suggestion to move the State House to the bottom, where protruding louvers would be hidden, by aligning them with the windows of the State House architecture (see switch box back) and putting the Malden City Council above, instead. It was then presented to Councillor Murphy for final input. As described by Boyle, the photos were blown up to the actual size of the box. Using an ancient technique Boyle learned back when he was a church iconographer, copies of the photos were traced onto the painted white box using old fashioned typewriter carbon paper. Next, the carbon lines were covered with a black line in paint and then painted over with a color light enough to reveal the black lines below. These lines were used as a guide to paint in highlights and shadows. Lastly, the final details are added. 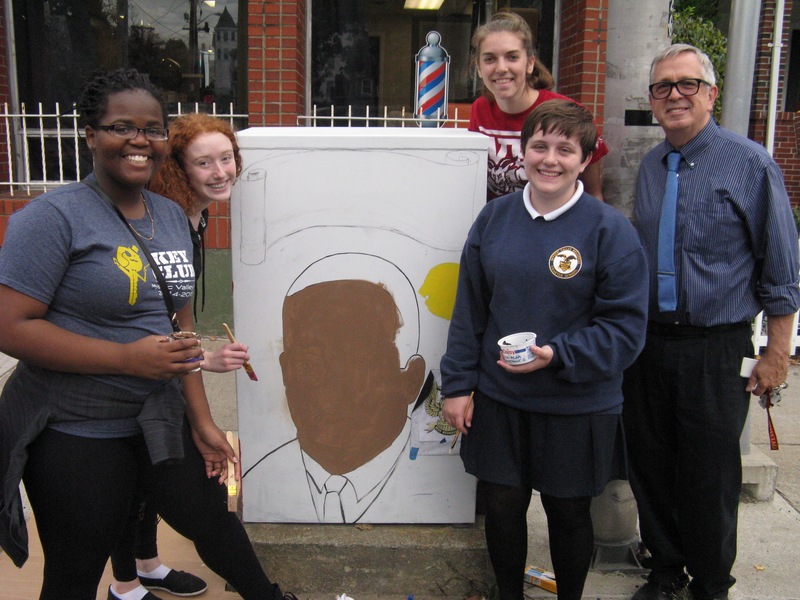 During the fall of 2016 a group of students, under the guidance of Boyle, began painting the switch box in front of 267 Salem St., once the home of Herbert L. Jackson, now a private residence. 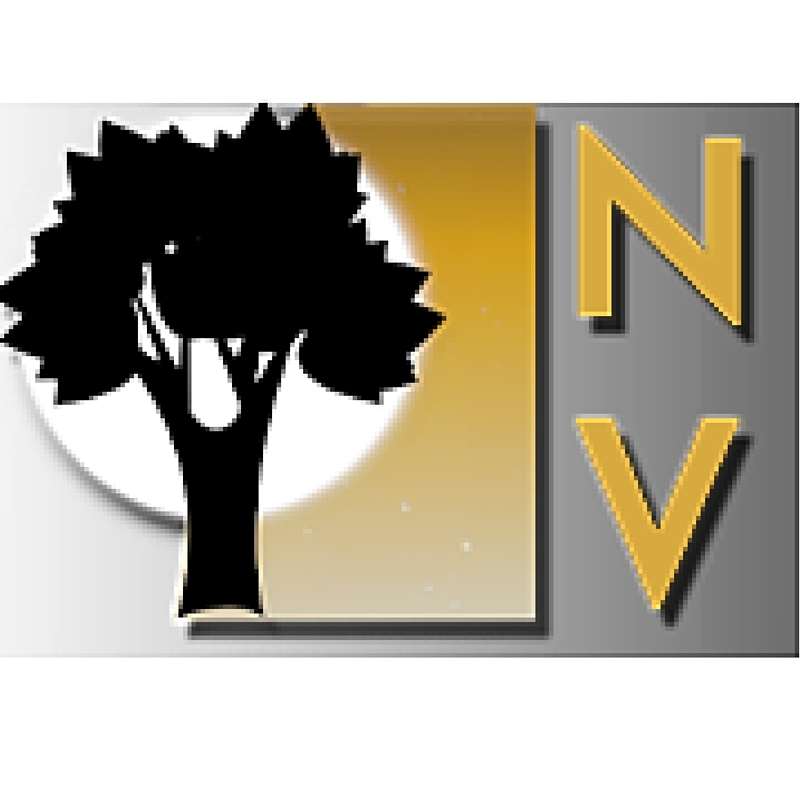 This commemorative switchbox project will be completed in the spring of 2017. 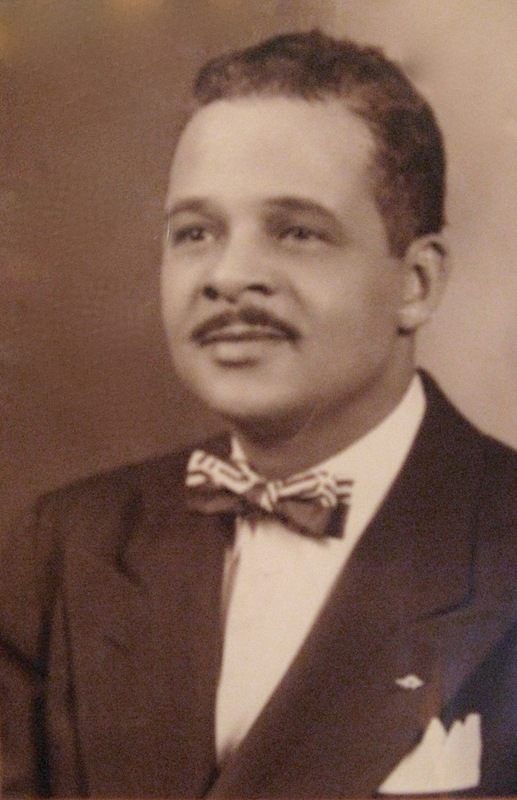 To learn more about who was Herbert L Jackson, see our Neighborhood View companion story here. Play the slideshow (below) to watch the switchbox art project in motion. This is education at its best. 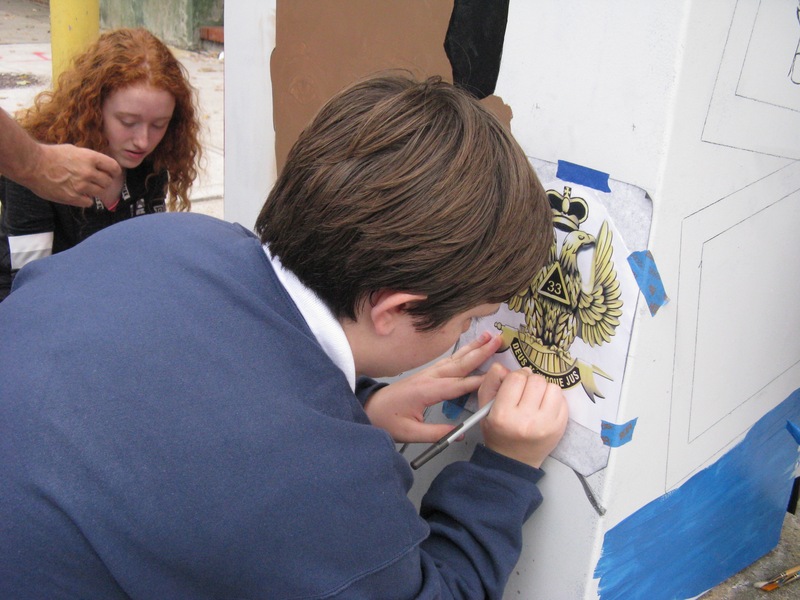 Firstly, the student artists learn an important piece of history and execute their lessons in a most tangible way. The the community learns the story through a community driven media and a wonderful community journalist/artist. Now, that is truly an energetic SWITCH! Teaching out of the BOX! Thank you!